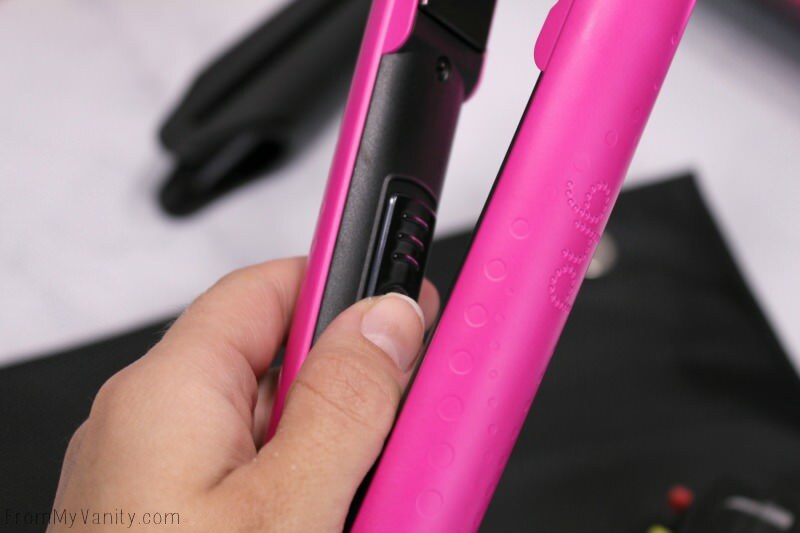 Before we dive into the tutorial, I do want to briefly share my experience and thoughts on the ghd flat iron. I know it is not a cheap purchase, but there are some things that are worth investing in. And I personally think that this Electric Pink Professional Styler is one of those things. 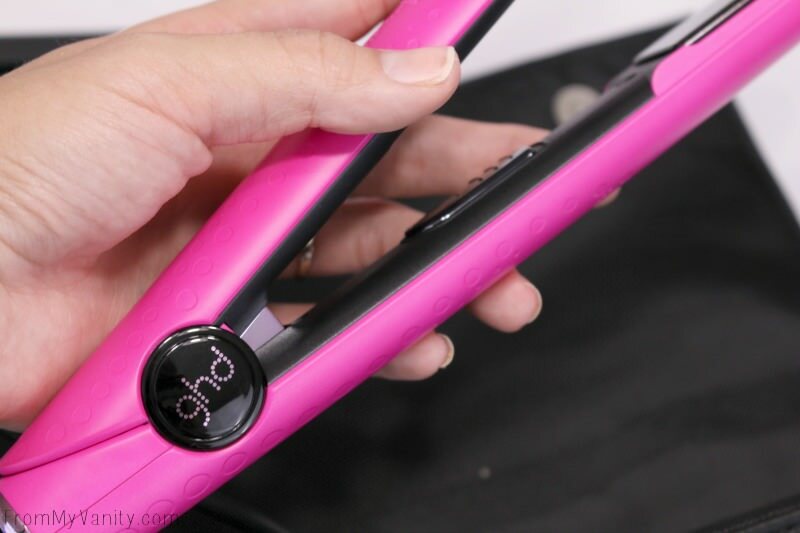 Especially since every purchase of an electric pink purchase, ghd donates money to breast cancer charities. A great thing to support. Plus you get a black and pink hairstyling tool! 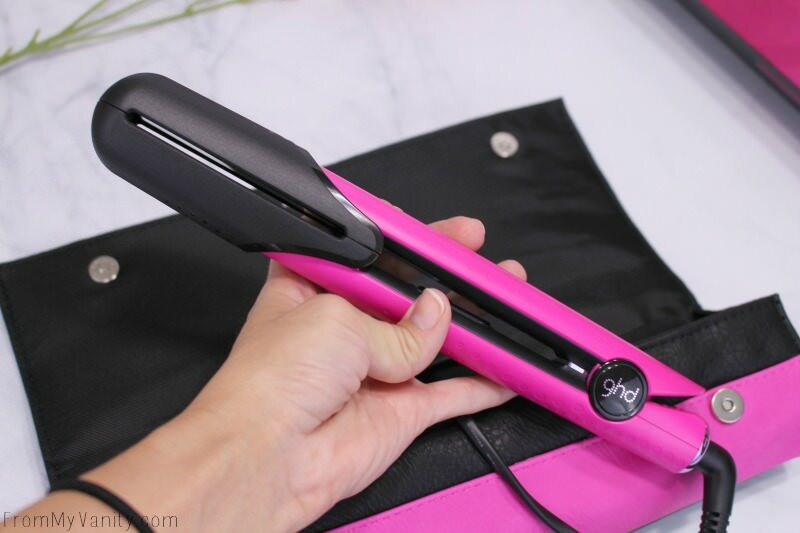 Once turned on this ghd flat iron was ready to use in less than 10 seconds. I was so surprised! Because of the high-gloss finish this literally glides through your hair like silk. I could not get over how effortless it was. And I don’t know if it was just my imagination, but my hair felt really soft after using it. I’ve used several professional curling and flat irons in my day as a cosmetologist student, but this one by far outshines them all. 1 // I cannot stress enough how important it is to use a heat protector. A nice flat iron will help prevent damage to some degree, but it’s still heat on your hair! A product like DermOrganic 8 Way Thermal Spray will give your hair a nice barrier. 2 // Brush your hair to help distribute the product and remove any tangles. It’s extra important to not have any knots when curling your hair with a flat iron. 3 // Part your hair. You want to be able to take about 1 inch sections of your hair to curl at a time. 4 // Warm up your ghd flat iron! This step is quick, because it’s ready in a flash! 5 // Clamp down on your hair like you’re about to straighten it, than before you move down rotate your wand 360 degrees. It helps to let go of the end of your hair for a second and then grab it again once you’ve rotated your wand. 6 // Depending on the type of curl you are going for, move quickly or slowly down your hair. I wanted fairly straight hair near the crown of my head that progressively got curler as it went down. So as I moved the wand down my (very long!) hair I went slower. See that defined curl at the bottom! Yay! 7 // Spray it in place! I am using this Fast Dry Shaping Spray Plus from DermOrganic. 8 // After putting your hair through all that heat, you’ve got to pamper it a little. I like to use some sort of serum or hair oil like this DermOrganic Pure Argan Oil, focusing just on the ends of my hair. This gives a very smooth look to the hairstyle and also gives the ends of your hair much-needed nourishment! And your done! You have curls! In the picture above I hadn’t broken the curls up with my fingers yet. Keep reading to see how the hair looks after it’s been styled! I feel like everyone might already know this hack…but I only started doing it the last year so I though I would share. This hack is specifically for those fabric-type headbands that slip over your head. Once you have your headband where you want it to be, divide the hair right below it and pull the front section back through the headband so that the headband is just sitting comfortably against your head. Now wrap that piece of hair next to your face around the headband and pull it through. (You’ll be pulling it out toward your face, not away from it). Your headband looks like normal but that twist in the opposite direction of how your hair falls puts a bit of counter pressure on the headband and keep it in place longer. 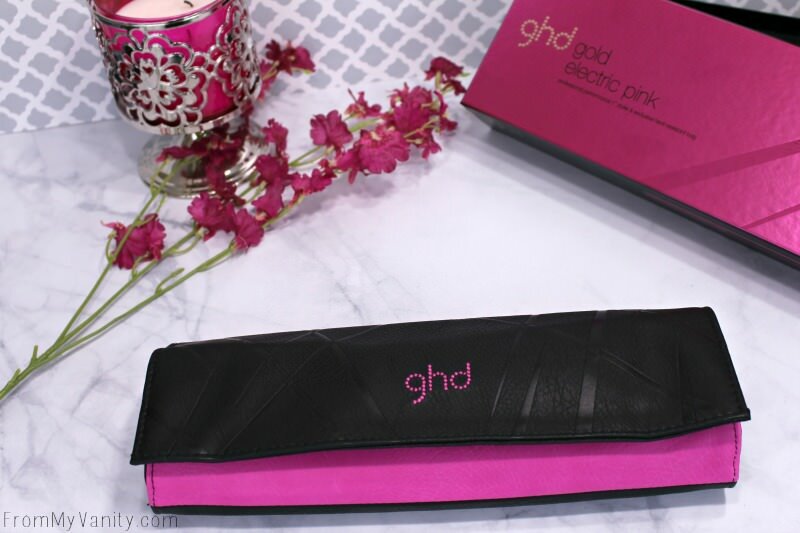 I forgot to mention that this specific ghd flat iron featured here is a limited edition set. I don’t know how long it will be available for, but if you want it (I mean…it’s pink and black! Who doesn’t want it?!) you might want to get it soon. 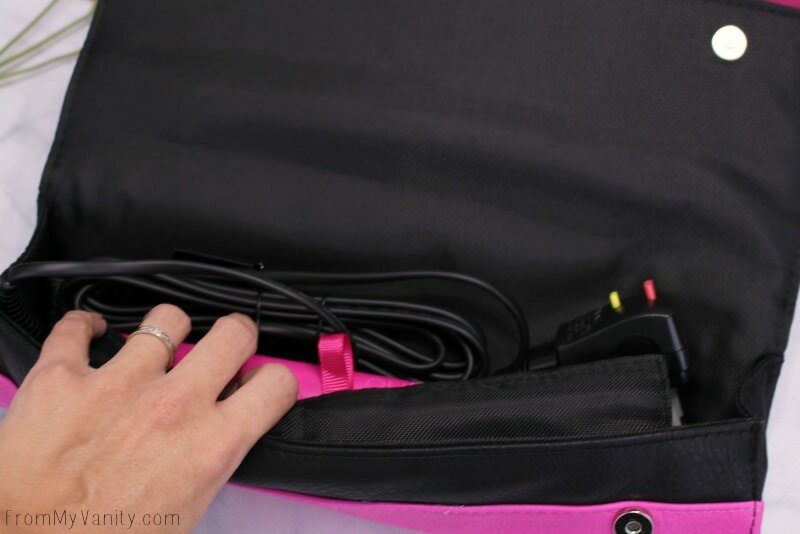 The Electric Pink Gold Professional Styler also comes with a heat resistant bag that is convenient to store it in, but also to use to set the hot tool on when using it. It’s a really nice quality bag — thick and durable, nothing cheap about it! Do you own anything by ghd? I can honestly say that when I need to purchase a new hairstyling product, I will definitely be checking out the ghd brand…and crossing my fingers that there’s enough in my bank account, too, haha! The products were sent to me for editorial consideration. This post was sponsored by ghd and some links above are affiliates. Any questions about my disclosure, please read here. Thank you for your support! Great review! I’ll live to check out this flat iron. I love these loose curls! <3 I haven't used a flat iron or dryer on my hair in a few months and it's never been healthier!! Usually I would get split ends all the time. And now when I do use it, a heat protectant is the #1 thing! I love my GHD, though now that I have very short hair, I use an airstyler for curls. I love your ‘do with that dainty band. You’ve inspired me to go buy a few for myself next week! great DIY. Also, you’re adorable. 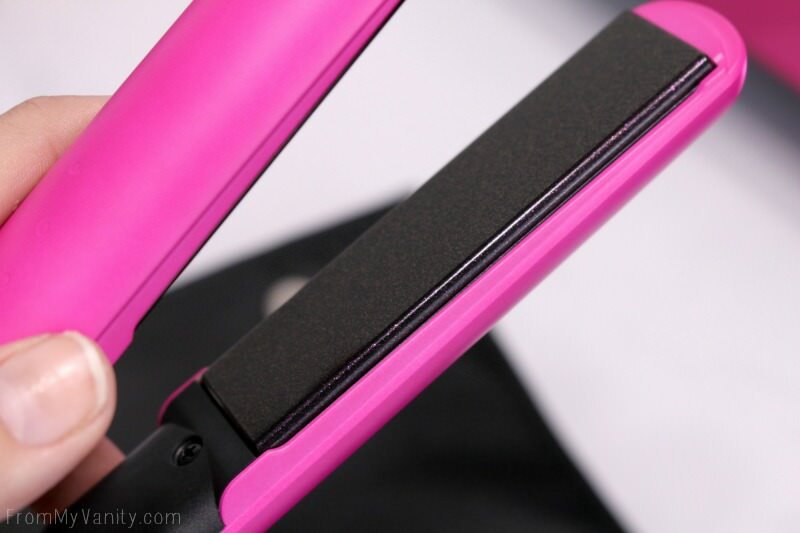 I’ve never had a flat iron before – this one looks great! In the same way I am obsessed with matte lips…I have always preferred stick-straight hair to curls. So a flat iron was the first heating tool I ever purchase, haha! You make this look so easy but I cannot for the life of me, do this. Haha! My hands and my brain do not work together on this! I am seriously uncoordinated and can hardly get the curl I want with a flat iron. I’m not giving up yet! Thanks for the tutorial!! I’ve always wanted to get a GHD flat iron! Hoping to purchase one next year.